*Category winners can collect their recognition sticker to place on their finisher medal at the Susan G Komen tent. The Run for the Pink will use the Bib Chip System. Your timing chip will be affixed to your bib. It is your responsibility to ensure that your bib is worn with the chip attached. No Chip...No Time. You do not need to return the chip after the race. There is plenty of Parking Capacity near the Start Area! We STRONGLY recommend that people arrive by 4:30am to park! There will be some congestion as thousands of cars will be travelling to the area! Please…please, give yourself enough time to park so you are not rushed on race morning. The parking fees will be around $10 at the Start Area. 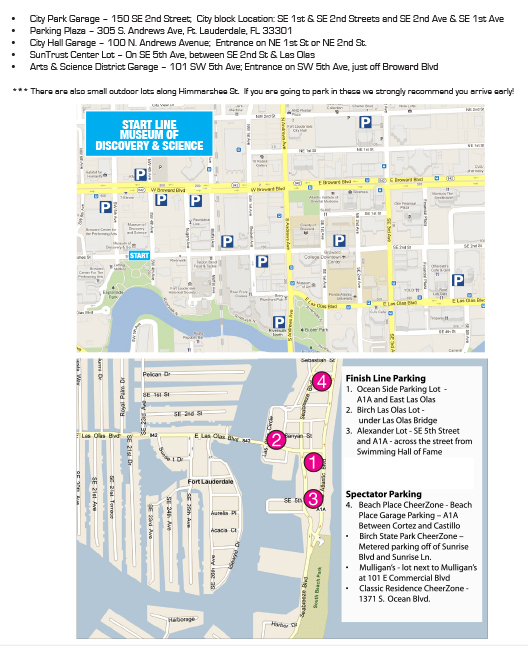 If you wish to park near the Finish Line on race morning, please arrive as close to 4:30am as possible in order to provide adequate time to get to the Start via the Shuttle Bus. After the race the Shuttle buses will be waiting by the Bahia Cabana Hotel (right by the Finish Area) to take runners back to the Start Line area. Thanks to our partner, the A1A Marathon, there will be a complimentary Gear Check for our runners. It will be located at the back of the Start Line Corrals; there will be 4 UPS trucks and a staff of volunteers, which will organize the gear check-in process. A ticket will be attached to your bag with the corresponding ticket number given to you. Keep your ticket with you while you run. Put it in your pocket, or place it in your shoe by your ankle. The UPS trucks will drive your checked belongings to the Finish Area, and will be available for pick up at the southernmost end of the South Beach Park. Runners are responsible for bringing their own Gear Check Bag. We recommend using your Susan G. Komen Goodie bag that you will received at the Expo. We recommend that you DO NOT check your wallets into a Gear Check bag. Leave your wallet in the car. There will be a complimentary shuttle bus service taking both runners and spectators from the Finish to the Start, and vice versa. Shuttle Service will begin at 4:00AM, and run through 1:00PM. If you wish to park near the Finish Line in the morning, please arrive as close to 4:30AM as possible in order to provide adequate time to get to the Start via the Shuttle Bus. After the Run the Shuttle buses will be waiting by the Bahia Cabana Hotel (right by the Finish Area) to take runners back to the Start Line area. The Susan G. Komen® Run for the Pink 6K will have a water stop mid-way on the route. It is located at Colee Hammock Park. Please follow the PINK route arrows and signs to stay on route and pass by the water stop. There will be port-o-lets located around the Start and Finish Lines. You can make onsite donations at the marked Susan G. Komen Tent located at the Finish Line. You can also make donations in your Participant Center online at www.komenmiaftl.org or by sending a check to 1333 S. University Drive, Suite 204, Plantation, FL, 33324.